The continuing dry weather this year is allowing some much needed work around the wetlands. 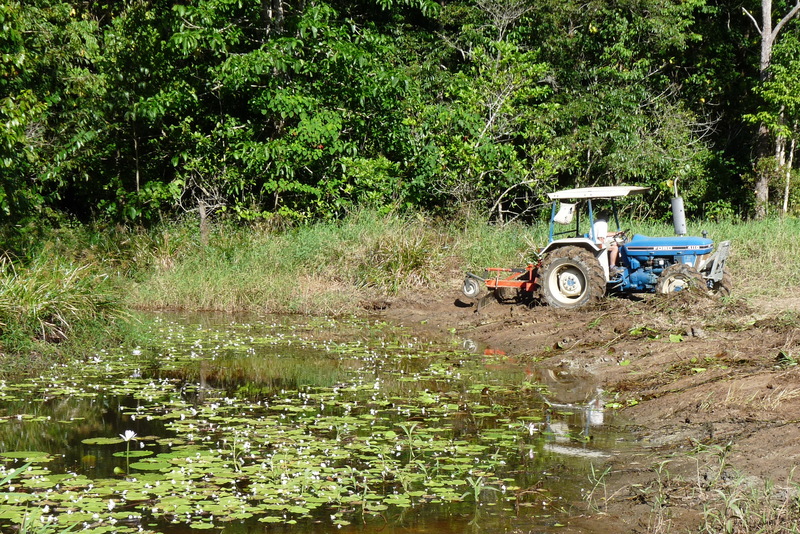 Allen has used the blade on the tractor to pull Para grass (Brachiaria mutica) away from the edge of the water. He then went on to form a better drain into Graham’s Pond but work is slow as he has to keep a watch out for Macleay’s Water Snakes (Enhydris polylepis)…….yesterday afternoon he unearthed ten of them. When I walked down with the camera I could only find a couple of very small eels but as I started to walk back a pair of Pacific Baza flew low over my head and landed in some nearby trees. Even from a distance their profile is unmistakable – I imagine they had come in to see what delicacies the tractor may have been revealing as did a Whistling Kite later on. As I moved around trying to get a better angle of the Baza I heard a ‘cooee’ and there was Allen walking towards me holding a little Macleays. As the poor thing was rather stressed for an immediate portrait I returned to the house with it held lightly in one hand and it gradually started to relax. I took some photos but it was difficult to get the right angle with camera in one hand and snake in the other. So the snake went into a clean bucket with a little water, some leaves and a rock to hide under. This morning Allen took some better photos of a much cleaner snake, in fact it was glistening in the morning sun! This is the only species of Enhydris that occurs in Qld and is described as a subaquatic species. It has dorsally placed valvular nostrils – they are just visible in the last photo. When finally, and I must admit somewhat reluctantly, I returned this lovely creature to the swamp I put it down on the edge of the shallow water. It immediately submerged into the muddy bottom layer and was gone from sight. I have learnt to admire snakes since living here and have handled pythons on numerous occasions when needing to remove them from chook pens or the proximity of orphaned fruit bats in care. 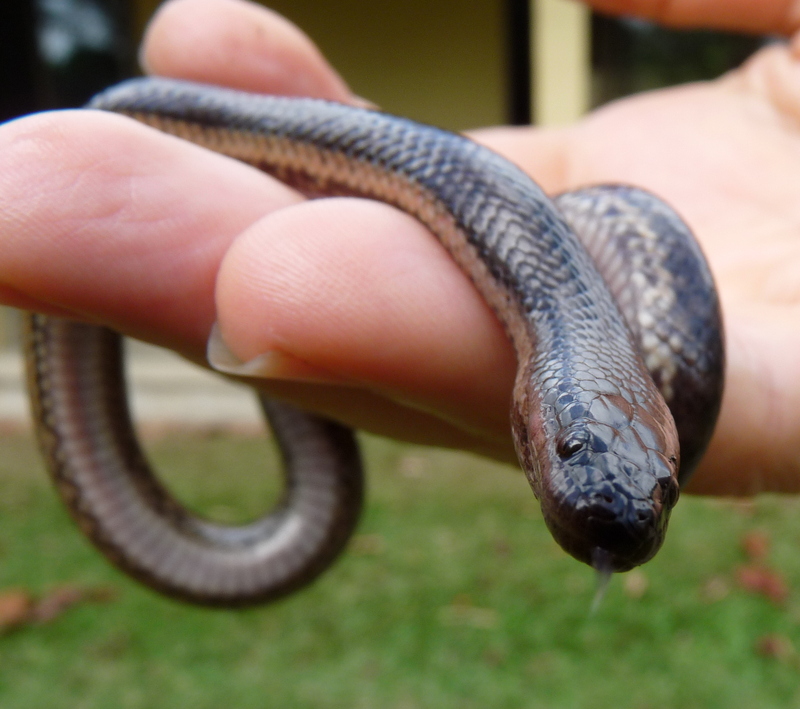 However, this is the first occasion on which I have enjoyed handling a snake and it has been a wonderful experience although there is no doubt that the snake’s small size combined with the knowledge that Macleay’s Water Snakes are not considered dangerous gave me confidence. 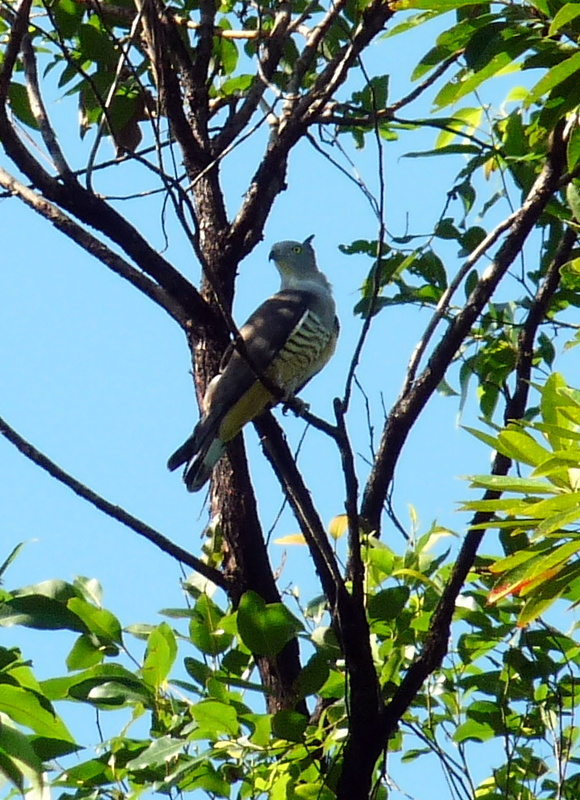 This entry was posted in Bird Observations, Pond Life, Reptiles and tagged Macleay's Water Snake, Pacific Baza. Bookmark the permalink. Not dangerous but mildly venomous. So many of them, suggests they outdo keelbacks in your neck of the woods? Many toads? Yes mildly venomous but rear-fanged and this one was so small it couldn’t do me any harm! 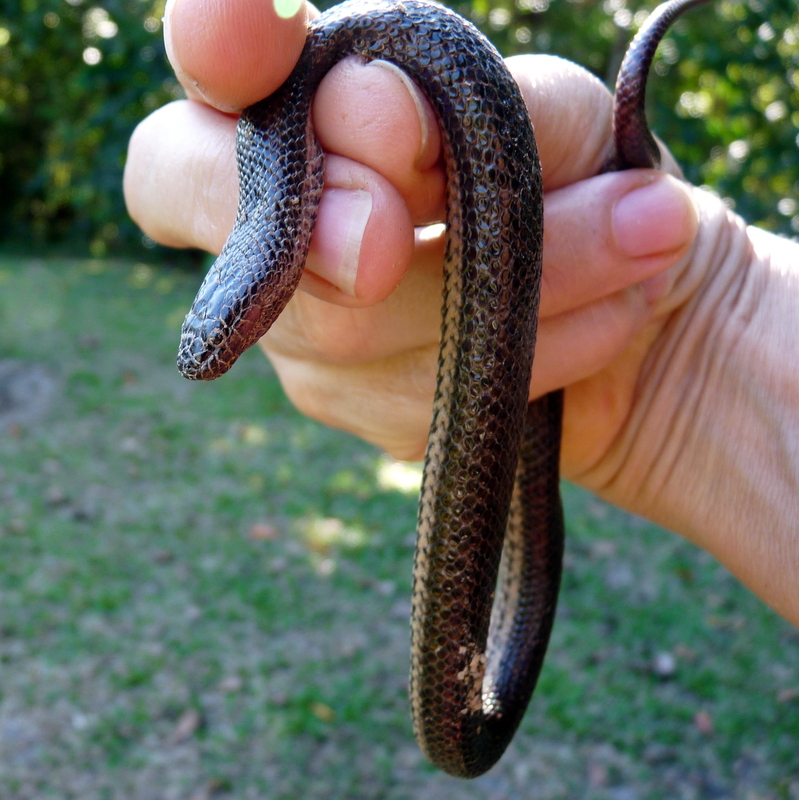 We do have keelbacks and see them fairly regularly but in spite of their ability to eat small cane toads without ill effect …we still have toads. Although water rats and some birds have learnt to eat the non-poisonous parts of cane toads we do put in some effort ourselves to control our toad population, described in an old blog entry January 2007. You really do live in a different world from me. That’s part of the joy of it all, though. Thanks Denis, I agree that the joy of sharing through the nature blogs is reading our diverse contributions. Lovely story. I don’t think many farmers, or others around here, would be thinking of doing work around their property without disturbing the snakes too much. I admire your attitude. Loved the Baza shot. Gouldiae, many of our local landowners would find my story more than a little odd! Thank you for your comment; it is fun to share the experience.